This is the Ukrainian acronym for my business. Yesterday we signed our first contract. 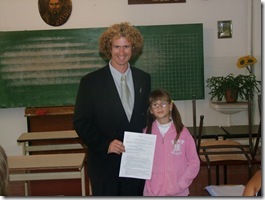 Here is a photo of Katya - the first student to join our classes. We signed up four students yesterday and have another sign-up evening today. Classes will start next week, and I expect they will grow by word of mouth. I'm not normally a nervous person. I have been more nervous at various times this week than I can remember in a long time. I am very much aware of my inabilities. I am thankful for the many people who have helped thus far. A number of people have asked me over the last few years, "Why do you want to live in Ukraine?" Today I read an article about corruption in Ukraine. You can read this interesting article from the Kyiv Post here, but I was reminded how deeply ingrained bribery and corruption are in Ukrainian thinking and culture. I reflected on an interesting situation on a train back in 2005. I wrote about the experience of two Russians telling me that this was the way they liked it (train experience). But what will I ever do to change the corruption I hate. Probably nothing. My life will just be that little more difficult because I refuse to be like them. Maybe it's just a case of pig-headed self righteousness or an unwillingness to accept my new culture. Or maybe it is the right thing to do. September: Teaching English in Rzhyshchiv and getting ready to leave Ukraine – plus a short visit to Kyrgyzstan at the end of the month. Last week 7 lads packed into the van and we headed north of Kyiv and camped by the huge expanse of water that is the Dnipr River. We had an absolutely beautiful place to camp, and we enjoyed bonding together cooking, eating, swimming, fishing, reading, singing, playing Frisbee and King of the Mountain. Jesse, the youngest, being the self declared winner of King of the Mountain. Its nearly midday Sunday. I'm just taking a break in attempting to get water to my house. I have the pump inside thawing out. I have a heater on in the bathroom trying to thaw out the pipes inside the bathroom walls. I have a fire lit outside the house against the wall where the pipes are. The wall obviously needs repairing as the smoke from this fire is going through the wall and filling the bathroom (and these walls are about a foot thick). I have the gas burner going in the pit next to the well (where the pump goes) to thaw the ice from the pipe that leads from the pump to the house. And its minus 20 outside so as I work outside I come in regularly to get warm again. Living without water is not fun - but it is a good excuse not to do the washing up! Right now outside it looks like a lovely sunny day. But don't be fooled - the temperature is on the rise and it is now minus 21 outside. I have been outside once for about 3 minutes to get some things out of the van and man it was cold. I'm not sure what the temperature was when I got up this morning because it was lower than my thermometer records. I have the furnace going full blast but the house is still not really warm - I have my thermals on inside! But the really fun thing is that the water pipes have frozen. I'm not even exactly sure where they are frozen - I think inside the wall where they come out of the ground and into the house. So I have no water. Soon I need to go out. At least I know my nose won't run - it will freeze before it can drip! Wow - this is the coldest I have experienced. Well I’m back from holidays and with 101 things to do, I’m finally sitting down to answer my 71 emails. So I decided to cheat. I’m going to write this same paragraph to everyone. Hopefully you’ll get another sentence or two as well, but if not I’m sorry. Hey let me tell you about today. It is minus 6 now and I think it’s been about the same all day. The forecast is for minus 15-20 over the next few days. So anyhow, I got up at 5:45, had a shower, dressed warmly and walked up the hill to Dan’s.